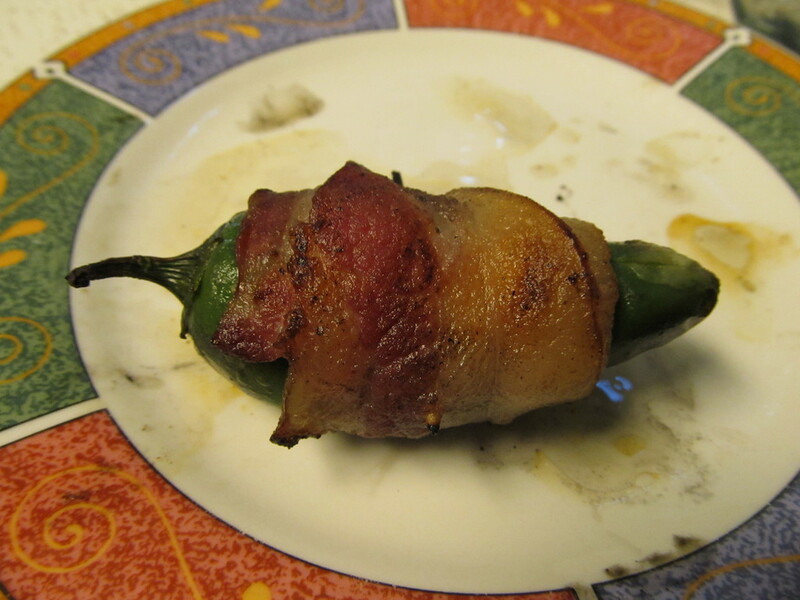 Last weekend, when we had our picnic at Lake Travis, one of the things we got at Central Market was jalapeños stuffed with cheese and wrapped in bacon. Yum. They were good. So today I decided I’d try making some at home. The ones we bought were halved, stuffed, and then wrapped. I took a slightly different approach, slitting the pepper on one side and stuffing it, but leaving it essentially whole. Then I wrapped a half-strip of bacon around it and stuck a toothpick through it. I cooked them on the barbecue, which may not be the best way to do this, since the dripping bacon fat caused a lot of flames. It may be that hot oven might be the best way to do this. They were quite good. Lucinda and I both liked them. Clearly, more experimentation is in order.